One of the very (very) few German words I know is the one for hedgehog. I don’t remember where or why I learned it, but it stuck in my head because igel sounds like eagle, and there can be no two creatures more dissimilar. 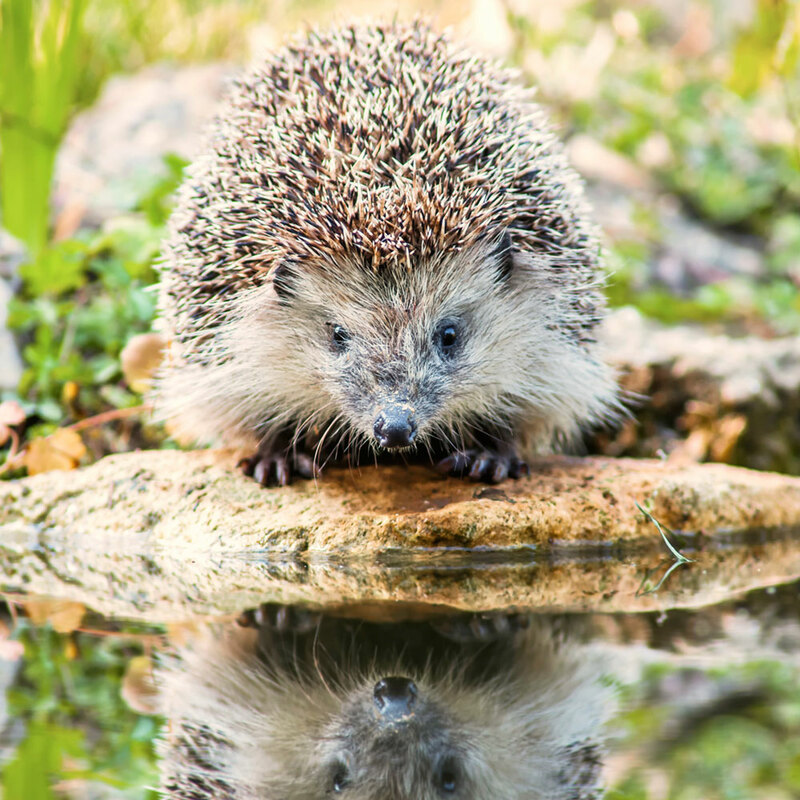 In fact there are not many creatures similar to the hedgehog at all. 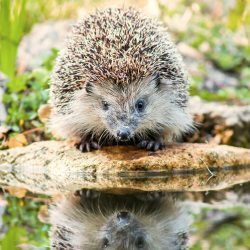 These curious urchins have been in Britain for 15 million years, yet they’ve been driven to the brink of extinction in recent decades, perhaps soon to topple into obscurity with their erstwhile peers – the woolly mammoth and sabre-tooth tiger. The culprits? Over-zealous gardeners and developers, scatterers of poisonous slug-pellets and builders of impenetrable fences. I’ve heard from local enthusiasts these pint-sized neighbours will walk 2 miles a night in search of sustenance, and can eat up to their own body weight in food. I’d rather not imagine what that feels like. My first introduction to the species came shortly before leaving for America, where no such creatures live – the porcupine being but a distant cousin. I was given a tiny bookshelf for my second birthday, holding the complete works of Beatrix Potter in tiny hardback volumes. 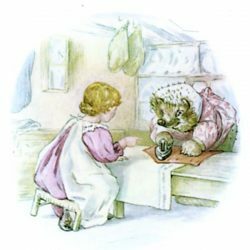 Mrs Tiggy-winkle was amongst my favourite characters – along with Squirrel Nutkin, (Mr) Jeremy Fisher, and the stalwart Peter Rabbit. As with many a children’s story in those days, horrid dangerous things happened to the main characters, especially if they’d been naughty. Mrs T, resident of Catbells in Cumbria, was a notable exception. She was far too busy to go about courting mischief. 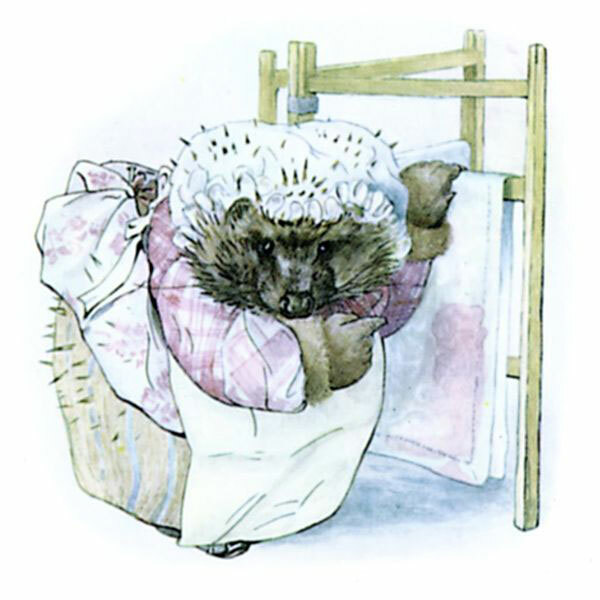 The little person made a bob-curtsey – “Oh, yes, if you please’m; my name is Mrs. Tiggy-winkle; oh, yes if you please’m, I’m an excellent clear-starcher!” And she took something out of a clothes-basket, and spread it on the ironing-blanket. I can tell you for certain you wouldn’t want to trust your clear-starching to a hedgehog, no matter what clear-starching is. When they walk they look as though they’re daintily lifting their hems, but they can smell a slug or worm three inches underground, and are quite happy to dig for it. Their little webbed paws turn into boots of soil, which doesn’t seem to bother them a bit. How do I know? I’ve recently taken up a new post as part-time stay-at-home daughter – the other part remaining as designer. There is quite a garden to oversee, and I’m woefully inexperienced, but we take a very flexible view of perfection when it comes to the outdoors. This is good practice for a die-hard perfectionist. Nature will, after all, do as she pleases. And nature may be cruel at times. Blackbirds are my favourite creatures of the air – for their jubilant songs and for their exemplary work ethic. They toil all hours to raise their young this time of year, and it smarts to see the remains of that labour after the sparrowhawk has paid a call. But she has mouths to feed as well. Not everything can thrive – not even one’s favourites – so balance is perhaps the best objective. 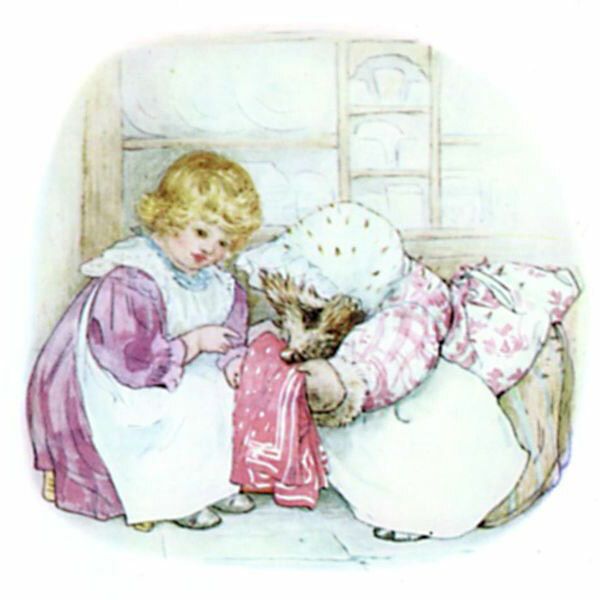 “That isn’t my pinny?” said Lucie. Mrs. Tiggy-winkle’s nose went sniffle, sniffle, snuffle, and her eyes went twinkle, twinkle; and she fetched another hot iron from the fire. Since we have our hearts set on growing greens, fruits and flowers, we face a moral dilemma. I could not physically kill a slug, and nor would I want to, but there is little point growing food and effectively handing it out as alms to the slug population. Anything within reasonable reach is considered a free buffet by these ill-mannered gatecrashers. We have everything in pots with awkward rims, covered in petroleum jelly and tied round the top with copper taping. Anyone bold enough to traverse the gravel will then be faced with a gastropodic obstacle course. Which, I’m assured by gardeners more seasoned than myself, is not enough. So, not wanting to get our hands dirty with actual murder, we’ve hired a mercenary. Her terms are quite particular. She wants a low dwelling with a front door facing a wall or fence in a quiet and rustic corner of the garden. She wants free access to surrounding properties (ideally four additional). She wants fresh rainwater and a little food provided daily – though not bread and milk as people tend to assume. Since she is carnivorous, I leave that side of things to my mother. I say she as we assume this is the ‘sow’, and her occasional visitor is a roaming ‘boar’, though it’s hard to tell them apart in their country fashions. We’re hoping for an ‘array’ come summertime, though that term rather conjures up carpet samples, or gloves in a department store display, than a litter of blind and spineless offspring. It’s best not to count one’s chickens, or hoglets in this case, but our little harvest is so far flourishing. Spinach is happily billowing out its big green sails, rocket is shooting sunwards and chard is champing at the bit. Even young delphiniums – apparently a delicious item on any buffet menu – remain untouched by mollusc mouths. “Oh, that’s a pair of stockings belonging to Sally Henny-penny – look how she’s worn the heels out with scratching in the yard! She’ll very soon go barefoot!“ said Mrs. Tiggy-winkle. While building the ‘house’, I petitioned my mother not to tell my friends how I spent the weekend, lest they thought I’d lost my marbles permanently. I could be seen weaving lengths of purple dogwood into a wire frame – quite feverishly, before it turned too brittle to use, or too thick to fell in the first place. How much care went into that little home, how many planning meetings passed, and how many minor injuries were sustained in its construction. We double insulated with bubblewrap and lined it with plastic for the wetter months. We hewed out a back door for deliveries, and fitted CCTV (for our own entertainment more than for her security). We stopped short of washing lines and clothes horses. 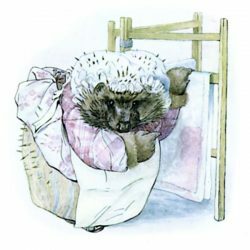 Since my early introduction to Mrs T, I’ve always had the sense of hedgehogs being too absorbed in their own service to seek out trouble or to meddle in other people’s affairs. Just so, it seems the real Mrs T is proving an asset to her community. 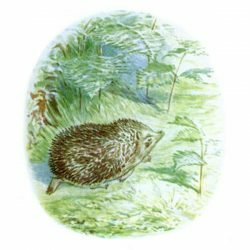 I find myself wondering what quality Sri Chinmoy would have assigned to the humble hedgehog. In his book Animal Kingdom, we find the duck symbolises discrimination, the buffalo wisdom, the rabbit sincerity, the jackal roguishness, and tortoise immortality. The eagle is vision, but the igel is not listed. Were the post of service not already filled by the squirrel, that would have been my best guess, but whatever the answer, no doubt it would have been a great surprise. She was running running running up the hill – and where was her white frilled cap? and her shawl? and her gown – and her petticoat? 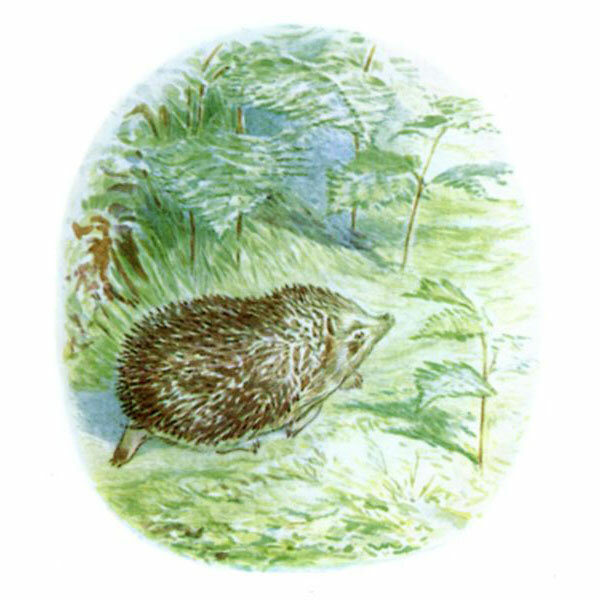 And how small she had grown – and how brown – and covered with PRICKLES!